Several key sponsors of New York City's annual Puerto Rican Day Parade pulled out after organizers decided to honor a convicted terrorist. 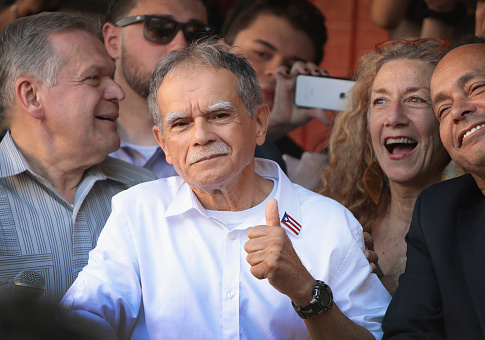 Organizers announced this year they plan to name Oscar López Rivera a "National Freedom Hero;" making it the first and only time they've awarded the honor, the New York Times reported. López Rivera was pardoned by President Barack Obama after serving over 35 years in prison for masterminding a series of bombings across the United States as a member of the Stalinist-Marxist pro-Puerto Rican independence militant group F.A.L.N. The most notorious F.A.L.N. bombing occurred in downtown New York City in 1975, killing four people. Six more people died in the bombing spree overseen by López Rivera (including a police officer) and dozens more were maimed. López Rivera got fifteen more years tacked onto his sentence while in prison for trying to escape with explosives. Former President Bill Clinton in 1999 offered all members of the F.A.L.N. clemency on the condition that they renounce violent terrorism, but López Rivera was the only one to refuse. López Rivera refuses to call himself a terrorist, however. "I do not have blood on my hands, and that’s why I cannot be a terrorist," he said after he was released on May 17. Police groups were among the first to pull out of the parade, with the NYPD and the NYPD's Hispanic Society announcing their intention to boycott. The FDNY officers' union and FDNY Hispanic Society on Tuesday announced the same. Other major corporations and parade mainstays including the New York Yankees, AT&T and JetBlue will also boycott the parade. Latin-American food giant Goya Foods also has pulled its sponsorship, but wouldn't attribute the decision to the López Rivera invite. But Democratic Mayor Bill de Blasio still plans to attend the parade. "The organization he was affiliated with did things I don’t agree with, obviously, and they were illegal," he said at a press conference. "All things considered, I understand why so many Puerto Ricans in this city respect that he fought for Puerto Rico, in their eyes." This entry was posted in Culture and tagged Bill de Blasio, New York, Oscar López Rivera, Puerto Rican Day Parade. Bookmark the permalink.